Home Holistic Health	Book Excerpt: A Deeper Perspective on Alzheimer’s and Other Dementias – Practical Tools with Spiritual Insights. 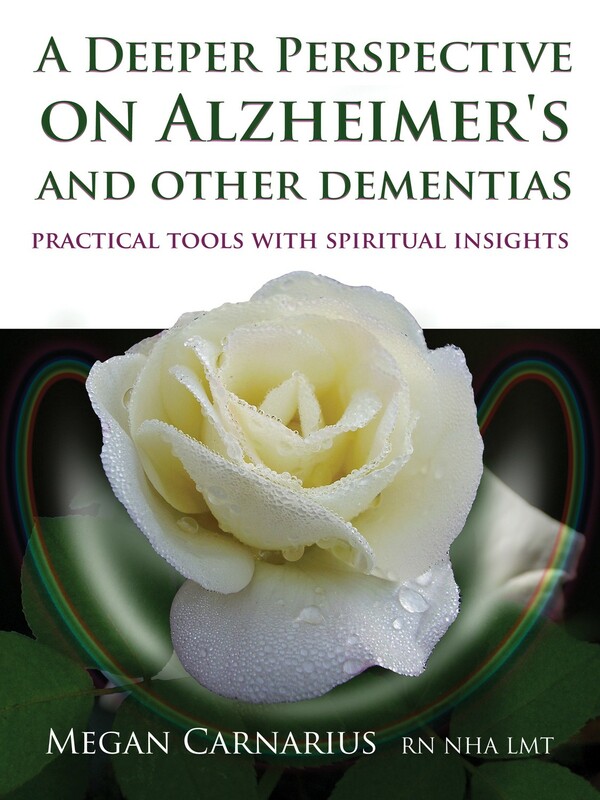 Book Excerpt: A Deeper Perspective on Alzheimer’s and Other Dementias – Practical Tools with Spiritual Insights. The brain is a vehicle. It is not us. The mind functions. It is not us. What is the most “you” of your “you-ness”? What is the “me” of my “I-am-ness”? In the largest sense, what survives? What does not? What is shed? What is gained? Even within the overlay of Alzheimer’s, I strongly believe the work of the soul is continuing—that learning at very deep levels is occurring, and that these life experiences accompany the soul as it departs this life. Some of us lead frenetic, fast-paced, busy lives, at a pace that is full steam ahead. Some of us lead purposely focused lives, filled with solitude and pragmatism. Whatever the life has been, Alzheimer’s changes it. It slows certain things down. It changes one’s ability to focus. It turns life review into a visceral recapitulation. We are not just reviewing our life in our thoughts, our brain and body are reviewing each developmental step we made in our life and physically shedding it. Yet at the same time, whoever the person has been, there is an essence that remains. In many ways, the necessary transformation that a person with Alzheimer’s undergoes is akin to being initiated into a new spiritual path. Some individuals experiencing the dementia process may display strong similarities to individuals who consciously choose a faith-based contemplative path and enter a cloistered monastery or convent. They are having a similar experience, although the causation is very different. Consider the scope of change required to do that. You lay down your worldly possessions and work really hard for a period of time on multiple mundane tasks. Your spiritual commitment takes you away from family and friends with whom you love to spend time, to a meditation centre and into the company of the spiritual order. Once there, you have to stay really still for hours at a time in meditation, moving deep into the recollections of the past—sorting, forgiving, and letting go within the context of this present life, so that you feel completely resolved and at peace. You dispense with all mind-chatter and move into spaces in your meditation that you cannot articulate to others—places that make you feel so connected to the Divine that describing it doesn’t matter. I want you now to imagine that you are an elder with dementia and have had a longing to follow a spiritual path, but your life took other turns and required other tasks. While these all felt very good and normal to you, you still need this opportunity to feel complete. For some people, the silence of dementia may allow this. I have worked with individuals with dementia who have felt that they have moved into a deep place within and are working at another level in themselves without the mundane, the chatter. They are, in essence, “cloistered” by the experience of dementia. “After one of my mother’s angry rants, a hospice worker asked her, “I see you are angry, and I wonder why?” She said, “I am having a conversation with God and people keep interrupting.” (Hands on a pretend wheel.) “It’s like I’m driving along with four passengers in the car, and I’m trying to talk to the person in the front seat, and the two people in the backseat keep talking over us.”” – Linda, Daughter. Many elders with memory loss who move into this spiritual phase begin with the usual vigorous denial and ego-engaging will strategies. Later, around Middle Stage, that changes and the person appears blissfully serene. Illnesses resulting from anxiety melt away. Medication ceases for these maladies. The person no longer suffers from asthma, high blood pressure, and digestive disorders that were very physical and clinically documented—without the emotional stress triggered by their earlier coping methods, such problems disappear. They enter the present so fully that the cares and concerns that plagued them no longer have a handhold. A kind of gentle gratitude starts to manifest, along with appreciation for others in daily interactions. Wrinkles disappear, and aging seems to recede—the youthful countenance conveying the presence of a timeless aspect of this person. They are known to smile insistently. Sitting on their own, their face still reflects this baseline of harmony. When someone interacts with them, the smile broadens. Family members will comment that this is the happiest they have ever seen their mother. Or that their father is so positive and just wants to hug them or hold their hand. Spouses sometimes experience this as well, but it tends to be a bit harder for a spouse. That’s because of all the personal work they have to do to assimilate what is different in their own reality and their own expectations and losses. At times, though, I see spouses make that leap and enjoy the time they spend with this person, feeling their peacefulness and letting it soak in. Alzheimer’s specialist Megan Carnarius, RN, is known for her warm human touch in working with people with dementia and those who love them. Trained in Europe and the United States, she has international perspective and 25 years’ experience in designing and running memory care settings. She started consulting in memory care design in 1996 and continues to assist owners with building designs as well as program and operational development. Megan also served on the Alzheimer’s education committee for 15 years. She is a works as a family consultant, professional trainer, and lecturer. Joined Up Thinking – A supplement drink to get you supple!